Introducing the Jen-Ken Kiln's ProFusion 52! Interior Dimensions: 52" width x 26" length x 14" depth. Big enough to handle your largest work, and Fiber Fast for everything else! It comes with an integrated stand with casters, 2 - 24" clay shelves, AND a SOLID 52" FIBER shelf. The stand puts the floor at about 34" high; the perfect kitchen-counter height for ease of loading. The lid is spring-assisted, so it is EXTREMELY light feeling for it's size. The floor is made of individual kiln bricks that are NOT cemented together, for easy replacement in the event of an accident. The controller is separate from the kiln, eliminating heat issues in the controller, and wall mountable. No more bending over to program the kiln! 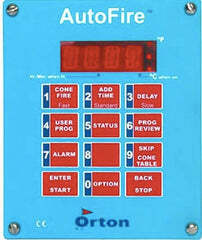 It comes standard with the Orton AutoFire 12-key controller, however you have the option to upgrade to the TAP touch screen controller.